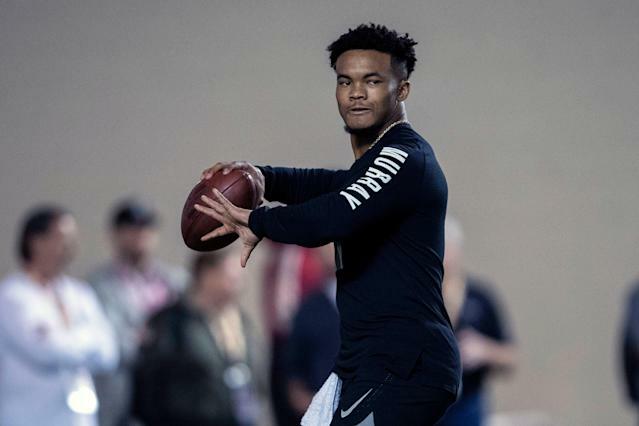 Ever since Kyler Murray declined to run or throw at the NFL scouting combine, anticipation grew for the Oklahoma Sooners’ pro day, which was finally held Wednesday in Norman. Ideally, teams thought, they’d see Murray — the 2018 Heisman Trophy winner — run the 40-yard dash, attempt difficult throws and yes, get his height measured one more time. Turns out they got one of the three, and even the one he acquiesced to was iffy. Murray declined to run and opted to let his combine height of 5-foot-10 1/8 inches stand, and while he made 70 throws on the day, some observers left noting that it wasn’t a particularly challenging array of passes, even for a pro day throwing session. As such, teams infatuated by Murray’s unique combination of speed, creativity and arm likely had their opinions reconfirmed by what they saw Wednesday, as Murray flashed quick feet, a smooth, fluid delivery and strong arm that allowed the ball to explode out of his hand on downfield throws, all while working out of an imaginary pocket. On the flip side, league personnel officials who entered with doubt about Murray, whether it’s related to his size, durability or ability to function within a traditional pro-style offense, were able to look at the same scripted workout Wednesday and believe it reinforced their doubts. The routes his receivers ran were basic, yet Murray still missed some throws. What’s more, a precious few of the attempts were on the move, something he’ll almost certainly be forced to do regularly in the NFL. Add in the fact Murray again didn’t reinforce his height — NFL teams had been told until the combine he’d measure in at 5-9 and 7/8 — or run the 40 — which isn’t a death knell, since it’s clear he’s super fast and Lamar Jackson didn’t do it either last year and still went in the first round of the draft — and a skeptic would have reason to call it a good, but not great, performance. Perhaps silencing skeptics was never what Murray’s pro day was about. That would make sense if, for instance, he already knows he’s going first overall to the Arizona Cardinals and new coach Kliff Kingsbury, the man with whom he shares the same agent. The rumors of the Cardinals being interested in Murray have been percolating for more than a month, with multiple league sources telling me during the combine that they believed Murray was well-positioned to go No. 1 overall. Those same sources believed it wasn’t final yet, that Murray would have to finish the process strong to get the nod, but they nevertheless believed that it would come to fruition — with the caveat that if it doesn’t, he’s almost certainly a first-round pick anyway. And with tape that impressive — and killer college numbers (5,362 total yards, 54 touchdowns in 2018) to boot — Murray certainly didn’t do anything to hurt himself Wednesday. He even looked looser in television interviews, giving off a vibe that came off more confident and serious than introverted, which some called him following some awkward media interactions at the Super Bowl and combine. Murray even nailed a question Wednesday from NFL Network’s Jeffri Chadiha about Charley Casserly, who caused an uproar last week when he reported that Murray’s reviews at the combine were the worst he’d ever heard for a top quarterback prospect. By the time the day was done, many on the NFL Network broadcast were racing to praise Murray for how well the day went. Heck, even Casserly said he’d give Murray an “A” for the overall performance, despite the fact he declined to run the 40, measure his height again or make many movement throws. And given how many others from NFL teams seemed to buzz about Murray’s pro potential in the weeks leading up to the event, it’s safe to assume Casserly wasn’t alone.